Most of them are on the Atlantic coast, of course. Lake Champlain has one or two as well. Whitlock’s Mill Light, Calais, ME 1901 A small brick tower on the tidal portion of the St. Croix River between Calais and Passamaquoddy Bay. The northernmost lighthouse on the East Coast. Lubec Channel Light, Lubec, ME 1890 A sparkplug-style lighthouse standing directly in the water of the channel between Maine and New Brunswick. West Quoddy Head Light, Lubec, ME 1858 A well-known and distinctive red-and-white-striped lighthouse standing on the easternmost point in the United States. Little River Light, Cutler, ME 1876 A small lighthouse on the island near the harbor in Cutler. Libby Island Light, Machiasport, ME 1823 A 42-foot granite tower on Little Libby Island just outside Machias Bay. Nash Island Light, Addison, ME 1874 A square brick tower, no longer in service. Moose Peak Light, Jonesport, ME 1851 On Mistake Island, five miles off the coast. Petit Manan Light, Addison, ME 1855 A granite tower 119 feet tall–Maine’s second-tallest lighthouse. Prospect Harbor Point Light, Gouldsboro, ME 1891 A small white tower at the mouth of Prospect Harbor’s inner harbor. Egg Rock Light, Winter Harbor, ME 1875 The light rises from the center of the pyramidal roof of the keeper’s house. Baker Island Light, Cranberry Isles, ME 1855 A white-painted brick tower not far from Bar Harbor. Bass Harbor Head Light, Tremont, ME 1858 On the southern tip of Mount Desert Island. Bear Island Light, Cranberry Isles, ME 1889 Just outside Northeast Harbor. Many of the lighthouses of Downeast Maine are located on high rocky headlands, so the towers themselves don’t have to be especially tall. Bear Island is a great example–the tower is just 31 feet tall, but the light is 100 feet above mean high water. Great Duck Island Light, Frenchboro, ME 1890 This light stands at the edge of the open ocean, with the islands of Frenchboro and Blue Hill Bay behind it. Mount Desert Rock Light, ME 1847 A conical granite tower on a barren rock 26 miles from the mainland–the most isolated lighthouse on the East Coast. Burnt Coat Harbor Light, Swans Island, ME 1872 A short, square brick tower 32 feet tall, standing on a 43-foot-high headland. Isle au Haut Light, Isle au Haut, ME 1907 A 40-foot tower, connected to the keeper’s cottage by a long sloping ramp. Fort Point Light, Stockton Springs, ME 1836 Located just at the point where the Penobscot River empties into Penobscot Bay. Grindel Point Light, Islesboro, ME 1875 A square masonry tower, listed in many sources as “Grindle Point Light.” I’m not sure which spelling is more correct. Pumpkin Island Light, Deer Isle, ME 1854 A small white-painted brick lighthouse, decommisioned but still in good shape. Dice Head Light, Castine, ME Built 1829. Inactive from the late 1930s, this light was reactivated in 2008 after its nearby replacement collapsed in a storm. Eagle Island Light, Deer Isle, ME 1858 A typical lighthouse of Penobscot Bay–small, white, and closely attached to the keeper’s house. Mark Island Light, Stonington, ME 1857 Also called Deer Island Thorofare Light. A small square brick tower. Goose Rocks Light, North Haven, ME 1890 This lighthouse rises right out of the water near the eastern end of the channel between North Haven and Vinalhaven. Browns Head Light, Vinalhaven, ME 1857 A little white tower, shorter than the keeper’s house it’s attached to. Saddleback Ledge Light, Vinalhaven, ME 1839 A small tower on a barren rock at the mouth of Isle au Haut Bay. Heron Neck Light, Vinalhaven, ME 1854 On the southern tip of Green’s Island, looking out toward Matinicus. Curtis Island Light, Camden, ME 1896 The island lies just at the entrance to Camden’s harbor. Rockland Breakwater Light, Rockland, ME 1902 A small square tower at the corner of the keeper’s cottage down at the end of the breakwater. Owls Head Light, Owls Head, ME 1826 A granite tower on a high headland just outside Rockland;s harbor. Matinicus Rock Light, Criehaven Township, ME 1857 A pair of granite towers, only one of which is still in service. Whitehead Light, St. George, ME 1852 A 41-foot granite tower with a beautiful keeper’s house that’s available for rental by the week, when it’s not being used for educational courses. Marshall Point Light, St. George, ME 1858 A cylindrical white lighthouse with a covered walkway connecting it to the keeper’s cottage. Monhegan Island Light, Monhegan, ME 1850 A squat gray granite tower on a hill east of the village of Monhegan–the highest point on the island. Franklin Island Light, Friendship, ME 1855 A small white lighthouse near the entrance to Muscongus Bay. Pemaquid Point Light, Bristol, ME 1835 An attractive white-painted stone lighthouse on a high headland. Ram Island Light, Boothbay, ME 1883 A small light on tidal rocks, connected to dry land by a sloping ramp. Burnt Island Light, Southport, ME 1821 One of the oldest lighthouses in New England. Cuckolds Light, Southport, ME 1907 A light that projects from the roof of the keeper’s house–an unusual design for Northern New England, though Connecticut has quite a few similar lighthouses. The house is square on one side, round on the other. Hendricks Head Light, Southport, ME 1875 A square brick tower (painted white)near the mouth of the Sheepscot River. Doubling Point Light, Arrowsic, ME 1899 A small octagonal wooden lighthouse, on the Kennebec River just downstream from Bath. Squirrel Point Light, Arrowsic, ME 1898 A small octagonal wooden tower by the banks of the Kennebec halfway between Bath and the open ocean. Pond Island Light, Phippsburg, ME 1855 A small brick tower at the mouth of the Kennebec, just off Popham Beach. Seguin Island Light, Georgetown, ME 1857 Seguin Island, located just off Morse Mountain and Popham Beach in Midcoast Maine, has a resident caretaker in the summer months, not to operate the light (which, like pretty much all lighthouses everywhere, is automated now) but to mow the lawn, do minor upkeep on the keeper’s house, and welcome visitors. Halfway Rock Light, Portland, ME 1871 A fairly large stone tower on a low rock ledge out in the open ocean off Casco Bay. Ram Island Ledge Light, Portland, ME 1883 A granite tower on a small rock island at the entrance to Portland Harbor. Portland Breakwater Light (“Bug Light”), South Portland, ME 1875 A small tower with classical architectural details, very atypical of New England lighthouses. Spring Point Ledge Light, South Portland, ME 1897 A sparkplug-style lighthouse, connected to the shore by a rubble breakwater. Portland Head Light, Cape Elizabeth, ME 1791 A white-painted stone-and-brick tower over 80 feet tall. One of the oldest New England lighthouses, and also one of the most photogenic. Two Lights, Cape Elizabeth, ME 1874 Two 67-foot towers a few hundred feet apart. One is still operational, the other is privately owned. Wood Island Light, Biddeford, ME 1858 A granite tower at the southern end of Saco Bay. Goat Island Light, Kennebunkport, ME 1859 A small lighthouse off Cape Porpoise. Cape Neddick Light (“Nubble Light”), York, ME 1879 Sitting on the Nubble, a small island close to the shore off Cape Neddick, this is one of the most picturesque (and frequently photographed) lighthouses in New England. 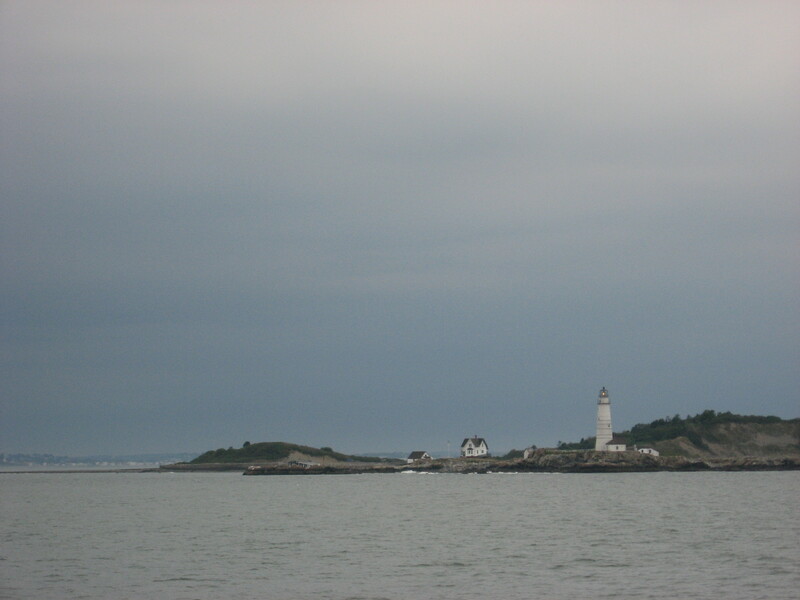 Boon Island Light, York, ME 1855 A dramatically tapered gray granite tower 133 feet tall, sitting on a low rock six miles off the coast from York. Portsmouth Harbor Light, New Castle, NH 1878 A 48-foot cast-iron tower, attached to Fort Constitution (the former Fort William and Mary) at the mouth of the Piscataqua River. White Island Light, NH 1859 Located about seven miles off the New Hampshire coast on one of the smaller islands of the Isles of Shoals. Poet Celia Thaxter lived here as a girl from 1839 to 1841; her father, Thomas Laighton, was the keeper of the lighthouse–not the current lighthouse, but an earlier structure dating to about 1820. Annisquam Light, Gloucester, MA 1897 A white-painted brick lighthouse on Wigwam Point on Cape Ann. Thacher Island Lights, Rockport, MA 1861 Twin granite towers 124 feet tall, on an island off the eastern end of Cape Ann. Derby Wharf Light, Salem, MA 1871 A very short, square lighthouse on Salem Harbor. Bakers Island Light, Salem, MA 1821 A conical white-painted granite tower. Boston Light, Little Brewster Island, Hull, MA 1783 The second-oldest working lighthouse in the United States, Boston Light stands at the outer edge of Boston Harbor. Graves Light, Hull, MA 1905 Like the Boston Light, the Graves Light stands at the entrance to Boston Harbor, but it stands not on a grassy island but on a small, unvegetated rock, giving it a much starker, grimmer appearance. Highland Light, Truro, MA 1857 A medium-size white lighthouse atop the sea cliff in North Truro on Cape Cod. Originally located close to the cliff’s edge, in the 1990s it was moved back 150 yards to save it from being toppled by the erosion of the cliff. Chatham Light, Chatham, MA 1877 An iron lighthouse on the headland at the netrance of Chatham Harbor on Cape Cod. Cleveland Ledge Light, Falmouth, MA 1941 An interesting mid-20th-century design, on a rocky shoal in the middle of Buzzards Bay. Brant Point Light, Nantucket, MA 1901 A small wooden lighthouse at the entrance to Nantucket’s harbor. Bird Island Light, Marion, MA 1819 A conical white-painted rock tower on a small island in Buzzards Bay. Butler Flats Light, New Bedford, MA 1898 This sparkplug-style light satnds in shallow water near the mouth of New Bedford Harbor. Borden Flats Light, Swansea, MA 1881 A sparkplug-style iron lighthouse on Mount Hope Bay near Fall River. Sakonnet Light, Little Compton, RI 1884 A sparkplug-style lighthouse off the shore of Sakonnet Point. Castle Hill Light, Newport, RI 1890 A very stubby granite lighthouse near the entrance to Narragansett Bay. Newport Harbor Light, Newport, RI 1842 An octagonal granite tower 35 feet tall. Rose Island Light, Newport, RI 1870 An octagonal wooden tower on a mansard-roofed keeper’s house, of the sort that’s more common around Long Island Sound. Sandy Point Light, Prudence Island, RI 1823 A cute little lighthouse in Narragansett Bay; formerly located at Newport Harbor. It’s almost ridiculously stubby. Bristol Ferry Light, Bristol, RI 1855 No longer operational. A small square brick tower on the side of a private residence. Nayatt Light, Barrington, RI 1856 No longwer operational. A small square brick tower on the side of a large private residence. Pomham Rocks Light, East Providence, RI 1871 On a rock in the Providence River. Conimicut Light, Warwick, RI 1883 An early example of the sparkplug-style light. Warwick Light, Warwick, RI 1899 A rather attractive round steel tower, painted white. Poplar Point Light, North Kingston, RI 1831 One of Rhode Island’s older lighthouses, long since decommisioned, at the entrance to Wickford Harbor. Said to be the oldest remaining wooden lighthouse in the United States. Plum Beach Light, North Kingston, RI 1899. Your basic sparkplug-style lighthouse. Beavertail Light, Jamestown, RI 1856 A square granite tower at the western entrance to Narragansett Bay. Dutch Island Light, Jamestown, RI 1857 A sturdy if somewhat ungraceful square granite tower 42 feet high. Point Judith Light, Narragansett, RI 1857 An octagonal stone lighthouse. Block Island North Light, Block Island, RI 1867 A small square tower atop a large granite keeper’s house. Block Island Southeast Light, Block Island, RI 1874 An octagonal brick tower attached to the side of a beautiful brick keeper’s house. Watch Hill Light, Westerly, RI 1857 A square granite tower. Stonington Harbor Light, Stonington, CT 1840 An attractive octagonal granite tower attached to a plain granite keeper’s house. Mystic Seaport Light, Mystic, CT 1966 An operational but unofficial light housed in a 25-foot wooden tower. Morgan Point Light, Noank, CT 1868 A wooden tower atop a granite keeper’s house. Avery Point Light, Groton, CT 1943 An octagonal tower made of concrete blocks, recently recommisioned after a 40-year hiatus. New London Ledge Light, Groton, CT 1909 A small tower atop a large mansard-roofed red keeper’s house, which itself sits on a square foundation rising directly from the water in the Thames River. New London Harbor Light, New London, CT 1801 Connecticut’s oldest and tallest lighthouse, an 89-foot octagonal tower of white-painted stone. Saybrook Breakwater Light, Old Saybrook, CT 1886 A sparkplug-style lighthouse at the end of the breakwater. Lynde Point Light, Old Saybrook, CT A white-painted octagonal granite tower 65 feet high. Falkner Island Light, Falkner Island, CT A 46-foot octagonal brownstone tower, painted white. Five Mile Point Light, New Haven, CT A 65-foot octagonal brownstone tower, painted white. Southwest Ledge Light, New Haven, CT 1877 A rather fancy cast-iron tower with a miniature mansard roof. Stratford Point Light, Stratford, CT 1881 A cylindrical cast-iron tower next to a cute keeper’s house, reminiscent of the lighthouses of midcoast Maine. Stratford Shoal Light, Straford, CT 1877 A granite tower on the side of a granite keeper’s house. Tongue Point Light, Bridgeport, CT 1895 A cast-iron tower 31 feet tall. Black Rock Harbor Light, Fayerweather Island, CT 1830 An octagonal stone tower, decommisioned in 1933. Penfield Reef Light, Bridgeport, CT 1874 A small tower on a stone keeper’s house surrounded by water on all sides. Pecks Ledge Light, Norwalk, CT 1906 A sparkplug-style lighthouse in Long Island Sound. Sheffield Island Light, Norwalk, CT 1868 Like many of the lighthouses in Connecticut (and unlike lighthouses elsewhere in New England), the Sheffield Island Light is both light and house–it’s essentially a large stone house with a tower rising from one end of its roof. Greens Ledge Light, Norwalk, CT 1902 A sparkplug-style lighthouse in Long Island Sound. Stamford Harbor Ledge Light, Stamford, CT 1882 A sparkplug-style lighthouse at the harbor entrance. Great Captain Island Light, Greenwich, CT 1868 A small tower on a large granite keeper’s house. Windmill Point Light, Alburgh, VT 1858 One of the Lake Champlain lighthouses, made of locally-quarried stone. Isle La Motte Light, Isle La Motte, VT 1881 A cast-iron tower. Juniper Island, VT 1846 A small cast-iron tower.